The United Nations announced the winners of the Unite Ideas #UNGAViz Textual Analysis and Visualization Challenge last week. Unite Ideas is a big data crowd-sourcing platform developed by the Office of Information and Communications Technology, which seeks to provide a platform for collaboration between academia, civil society, and the United Nations.The vast amount of information generated by the UN in at least 6 official languages, and formats e.g. documents, datasets, and multimedia is increasingly being made available to the public as “open data”. At Unite Ideas, the public can access not just these these datasets, but also the source code of the solutions to previously completed challenges and build on them. Solutions and expertise developed can be re-used by governments and civil society to support international peace and security, sustainable development, human rights, international law, and humanitarian aid. #UNGAViz is the sixth challenge issued by Unite Ideas. Till date, academia, the general public and private companies have have contributed more than 50 open-source solutions, many of which will be used by the United Nations or shared with Member States. Under this challenge, the first collaboration between the United Nations Office of Information and Communications Technology (OICT) and a Member State agency, the United States Department of State, developers worldwide were asked to create an open-source tool capable to provide greater visibility into Member State voting patterns on General Assembly resolutions, improving transparency about their voting choices and making it easier to gain insights from them. The United Nations General Assembly has passed over 13000 resolutions, since its first session in 1946. Along with technical merits, solutions were judged based on their potential to support policymakers dealing with humanitarian challenges, peace and security issues, and other international matters, sometimes under extreme time pressure. Abdulqadir Rashik, an Indian software engineer was declared the winner with his open-source tool, "Global Policy". 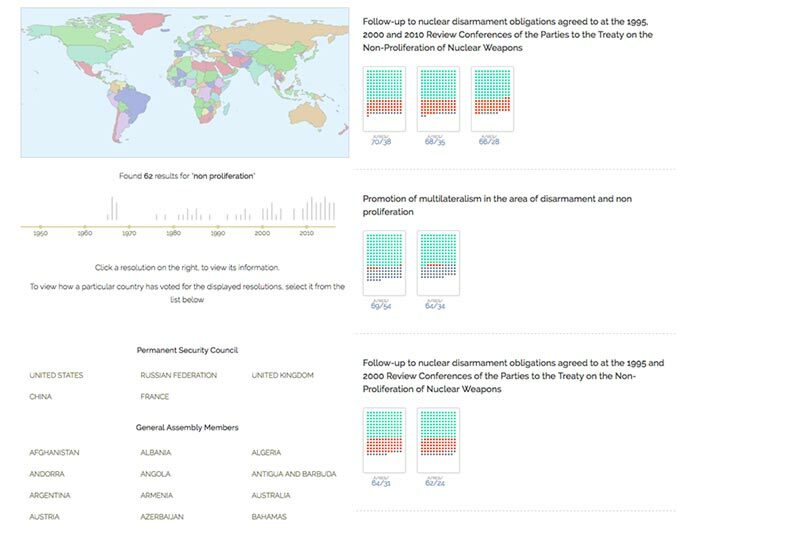 It provides decision makers insights into three key areas: 1) A broad overview of resolutions passed related to the chosen topic and interest in the topic over time; 2) analysis into the behavior of any particular country with respect to the resolutions found (including comparison of voting patterns with other countries, to find like-minded nations which tend to cast the same vote on the given topic, as well countries which generally oppose the vote cast by the chosen country); and 3) a detailed look into any one of the resolutions found, making data such as the date on which it was passed, voting on the resolution is easily accessible, along with a link to the entire resolution text if the user wishes to analyse in even deeper detail. Mr. Rashik is a frequent contributor to Unite Ideas challenges, and he previously won the top prize in the #LinksSDGs challenge for his submission, “Links to Sustainable Cities”, an interactive visualization that identifies and maps the links between Sustainable Development Goal 11, Sustainable Cities and Communities, and the other 16 Goals. Maximiliano Lopez, an information technology consultant from Argentina, was the runner-up, with a multilingual application, with an interface and authentic search capabilities in English, French and Spanish. The application makes use of Information Retrieval libraries (Apache Lucene) allowing users to find resolution on the basis of terms. Resolutions may also be filtered on the basis of their date and the availability of voting records. The Internal Displacement Monitoring Centre (IDMC) has set the #IDETECT challenge to create a tool that will be used to monitor internal displacement as a result of natural-hazard induced disasters, armed conflicts, generalised violence and development projects. The tool will provide the humanitarian community with an easy way to extract and analyse facts from a variety of documents, news, field reports, social media and any other relevant source). Using Natural Language Processing algorithms, the tool should automatically extract “facts” from the documents. A fact is a displacement figure and each fact should include the date of publication of the document, the location where displacement happened; the reporting term used in the document and the reporting unit. There are different reporting units used to identify displaced population should be grouped in two main reporting units (people and households) and the number displaced. Relevant documents should be classified in three categories, “Disasters”, “Conflict and violence”, and “Other”. representing different triggers of displacement. The tool should provide a platform for visualisation and quantitative analysis of facts. This challenge is open till April 28, 2017. All the winning solutions from past challenges can be accessed here.